Tracy Reese chose a two tone mani at her Spring 2013 runway show. This mani is super cute and real easy to do yourself. 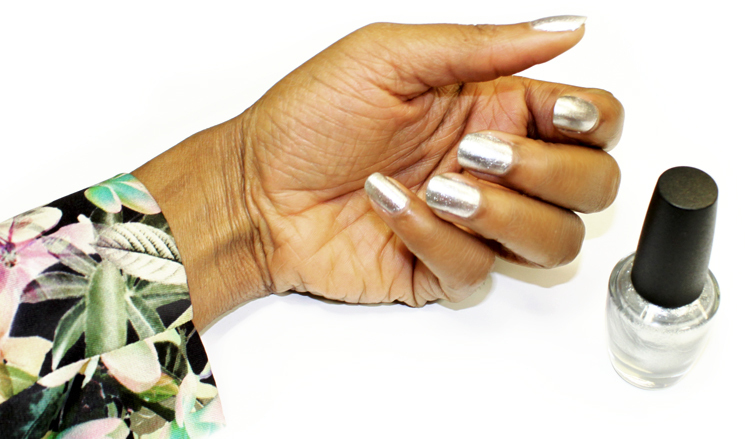 You'll need two contrasting shades of nail polish, scotch tape and clear top coat. Step 1: Apply two coats of the color you want as the main color and allow to fully dry before moving on to the next step. I started with a metallic silver nail polish. Step 2: To section off the triangle place two strips of tape to each nail diagonally. You can make your triangle wide or narrow, its up to you. Step 3: Apply two coats of the second color of polish onto the sectioned triangle. Step 4: Gently remove tape strips, let dry for a few minutes then apply your top coat.